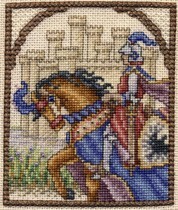 This colorful miniature design features a medieval knight on horseback, all decked out in tournament finery. A moated castle can be seen in the background. The design is stitched over-one, and accented with an over-two stitched border, blending filament and beads.